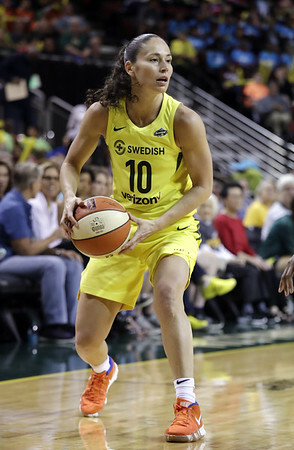 Sue Bird will play in a record 11th WNBA All-Star Game Saturday in Minneapolis, six days after she set a new mark for regular season games played. With every assist, the Seattle Storm point guard adds to her all-time league-leading total. This fall, she’ll look to collect a fifth FIBA world championship medal with the United States national team. She is already the only player with four (three gold, one bronze). But the former UConn star didn’t accomplish all this via her work over the last week or month. Bird’s commitment to take care of herself and her body has been going on for years. It has allowed her, two months shy of her 38th birthday, to be playing some of the best basketball in a career that will likely include her induction into the Naismith Memorial Hall of Fame once she is eligible. In her final game before the All-Star break Tuesday night, Bird posted a double-double of 11 points and 11 assists in a win over the Indiana Fever, the fourth road game in a stretch of nine of 10 away from KeyArena. For the season, she is averaging 10.0 points, 1.7 rebounds and a career best 7.3 assists with an assist-to-turnover ratio of 3.8. Her assists are second in the league to the Chicago Sky’s Courtney Vandersloot. Her selection to the All-Star Game moved her one ahead of retired Indiana standout Tamika Catchings for the most in league history. On July 20 at Mohegan Sun Arena, the Syosset, New York, native tied DeLisha Milton-Jones’ record for games played and on Sunday she became the first player to see action in 500 games when she took the floor in Atlanta for a matchup with the Dream. She has played in at least 29 games in each of her first 15 seasons - she sat out the 2013 campaign because of surgery to remove a cyst from her right knee - and has played in 24 of 26 games this summer. “A couple years ago, I had to take a good, hard look at myself in the mirror and say, ‘How do you want your career to end?’ ” Bird said. “At that point I teamed up with the right people and got on the right program. How good does she look and feel? Last month, Bird and her girlfriend, United States national soccer team star Megan Rapinoe, appeared together in ESPN the Magazine’s Body Issue. The decision to do it was easy. Color Stewart, who also appeared in the Body Issue, impressed. Stewart, in her third WNBA season after helping UConn to four consecutive national championships, leads the WNBA in scoring and is fifth in rebounds. She may be the leading candidate for MVP honors. “Watching Sue, as you can see it works,” Stewart said. “She has done so much for women’s basketball and is still playing at a high level. There are no shortcuts. Every day she knows she has to put work in and it doesn’t matter if she is feeling good. What’s also been great for Bird is the Storm’s turnaround. Seattle (19-7) has a 2½-game lead over the Dream (16-9) for the WNBA’s best record and a three-game edge in the loss column over Minnesota for the second spot. The two top teams receive byes into playoff semifinal series and avoid single-elimination games. The Storm have been one and done the past two seasons. Of course, winning teams have always had a way of following Bird around. She is one of 10 players with NCAA and WNBA titles, and Olympic and FIBA world championship gold medals. She was a part of two national championship teams at UConn, including the 39-0 2002 club when she was the consensus national Player of the Year. She’s also won two WNBA titles in Seattle (2004, 2010). Posted in New Britain Herald, UConn on Friday, 27 July 2018 21:09. Updated: Friday, 27 July 2018 21:11.